Green smoothie recipe – you have to try this! We have been enjoying plenty of green smoothies on these hot summer’s days. I love green smoothies as a way to sneak extra spinach into our diet. Yes, I believe it’s important to eat veg in their whole form too (like salad and cooked veg with meals). But, if you can sneak some greens into a smoothie that otherwise would have been just a fruit smoothie, then why not?! If you're wondering why you should be eating plenty of greens, have a lot at my blog post here about why greens are a brilliant 'every day super food'. My toddler, just like most toddlers, can be a fussy eater at times. I often get asked the question by friends, fellow moms, and clients 'how can I get my kids to eat more greens?' Enter green smoothie...my toddler LOVES them! And the greens get into his tummy, so we’re all happy! Are you getting greens into your diet on a daily basis? If not, why not try a green smoothie? If I’m having this as a breakfast then I like to have it as a smoothie bowl. A smoothie bowl is really literally just a smoothie poured into a bowl, with something crunchy sprinkled on top to add some texture and make it look pretty. I like to top my smoothie bowls with chia seeds, coconut flakes, and sunflower seeds. 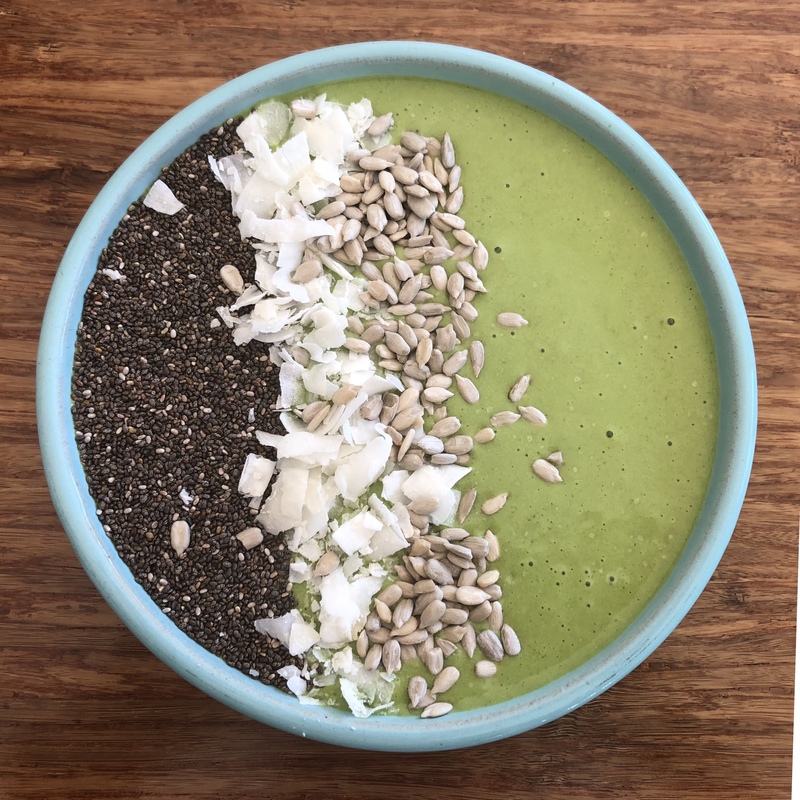 I like mine in smoothie bowl form because I enjoy the texture, and I enjoy crunching and chewing a bit, rather than just slurping a smoothie down. When you chew food (yes, even smoothies!) your brain registers that you're eating a meal, and you will more likely feel full and satisfied, as apposed to when you drink something. If we're having smoothies as a snack, then we usually drink them.